Cool photo isn't it? I took it yesterday at the Festival de l'Oh ("Oh" is pronounced the same way as "eau" which means water in French). As you can guess, this festival is pretty water-centric: What kind of fish live in the Seine? How many canals around Paris? "...to drink or not to drink tap water? ", etc. And to make it more fun, they also have several shows, like this one performed on a Péniche (a flat boat made for rivers) by circus artists. Pretty cool, even if it rained a bit! So, no testosterone (see yesterday, but water. Oops, that would be Eric, not Erc. Okay, I admit it -- this time I actually did want GF, so I hurried. Also forgot to close up the parentheses. Did I mention I'm a copy editor. Seriously, I learn about SO much interesting stuff from you, Eric. Now let's see what kind of fascinating tangent this leads us off on. So much for the copy then! But being the first to comment is undoubtedly worth a few typo LOL! Just FYI, not that you care, but Russia just won the Eurosong contest. Abig round of applause for soon to be famous in Europe Dima Bilan. Eric, very nice photo. Love her costume - bird on a perch? Here we have the Chicago River but it's not used for celebrations with the exception of St. Patrick's Day when the river is dyed green. Here's my favorite from ESC 2008: Switzerland! That is a cool photo and fun Festival. Interesting costumes -- reminds me a little of Cirque du Soleil. I bet you took more than just one photo? We were wondering where you were. Can you imagine how difficult that would be on a moving boat? Great that you see so much of the things that are happening in Paris! How many times have you been GF this month? I like this photo very much. It reminds me of those old fashion funfairs. Just lovely! You're very kind, Eric :-) But typos are interdit in my OCD world. Alexandra, are you being a sore loser? (Okay, I wasn't that impressed, either.) And why was he singing in English? I kind of miss the good old days when French was the international language. Alexandra, Thanks for the link to the Swiss singer. Very nice voice. When I was in college in NYC, a lot of my friends were from Switzerland. They all spoke Italian, plus English -- some spoke German and French as well. It makes the Swiss accent interesting and unique, I think. Never seen eau as oh, Eric. Very interesting festival. I love water, i always find it so peaceful, It's a place to go and think. This young lady looks quite high up. How difficult. She reminds me of the the cartoon Tweety Pie. The rain was merely fitting in with the theme, surely. I really should be in bed but there's a documentary on tv which is compelling. All about les maisons closes! En Francais, too, which is great. To sleep or to learn? Ohhh so difficult. The "bird" is festivating in the middle of the "O" which looks to be in the middle of l'eau (de la seine) which is central to the theme of Festival de l'Oh. Wow, a triple visual pun. Or is that a "tipple" pun? Ouch. C'est tres interessant, Eric, le documentaire que je regarde en ce moment la. Alors, j'ai envie d'avoir un photo de Le Sphinx -l'exterieur, bien sur! Est-ce que c'est possible de nos jours ou peut-etre le batiment n'est pas la? Rose -- only 3 times GF, but who's counting? Alexandra -- I'm with you, ma petite techie: Paolo Meneguzzi can sing, and he's molto carino, too. Lois, why so many Swiss friends in college? Years ago, I had a Swiss-Italian boyfriend, and he spoke 8 -- count 'em, 8 -- languages fluently. Wow. Rather impressive, and very humbling. Before I met him, I thought I was hot stuff because I spoke 3 (including English -- my mother tongue -- which probably shouldn't even count). Alexa, "Why so many Swiss friends..." I think it is because their families in Switzerland wanted them to go to college in NYC. They had already attended various colleges in the EU, and now they were just putting on the finishing touches. I haven't spoken to any of them in years. The last I spoke to was Axel-Charles in 1999 or 2000. He told me that Constantine Demetrius was still in love with me. I didn't say a word. After college a lot of us settled down with our careers, and started having our own families. When I was talking to Axel in Geneva, Switzerland, he was in the middle of taking his kids to school. I could hear them in the background running around and talking. Very cute. This picture looks like a painting. C'est assez impressionnant, tout y est: les couleurs, la composition, le cadre choisi. ça ressemble au niveau de la matière (surtout l'eau) au courant pointilliste, et le thème du cirque rappelle Seurat...I really love it. Tough day, I can't speak English anymore. Off to bed now. Et ceci est un compliment, je trouve que graphiquement c'est une des photos les plus abouties. BTW Alexandra, Axel's mom's family was from Italy and his dad's from Germany. He was born in Geneva. He spoke a lot of Italian and had a beautiful voice like this signer that you like from Switzerland. Constantine's mom's family was from France and his dad's from Greece. He was born in Geneva. He had a French accent sort of. Guille, You had a tough day:( We were watching the royal wedding and EU song contest. We missed you. Ah, je vois. Une histoire d'O, en somme. Oh, I see. A story of O, then. Guille -- moi, aussi, J'ai trouve tres chouette cette partie du film Paris, Je T'aime. Lois -- Aah, what might have been . . .
Must admit (the ultimate divorce notwithstanding), I don't regret a thing, mainly because of our gorgeous daughters and the fact that we remain fast friends. Lois, I agree with you! 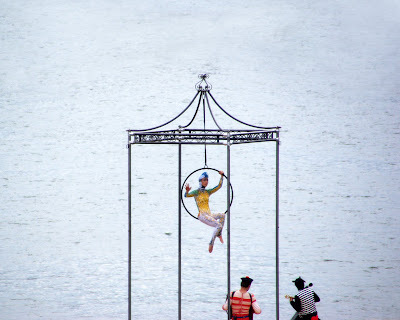 In particular, it reminds me of the Cirque show called "O" which runs in Las Vegas and is entirely water based. I have seen several of their shows, but not this one. I thought the same thing as you when I saw Eric's photo. Nice photo, by the way, Eric! Kelly, That is why I was very careful to say Geneva, Switzerland:) And not Geneva, Illinois USA. I like how you cropped this, Eric. It seems you cut off the bottom (or shot it that way) so we couldn't see the riverbank. It leaves the "bird" dangling precariously and makes the Seine look like it could be a vast ocean. Guille!!! I love it when you speak french here. I also remember this short film of Paris je t'aime. I wonder if the french enjoyed this movie (or rather, the short films) as much as we foreigners did. Did you know that one of the directors is brazilian? So Eric, I really wanted to know: to dronk or not to drink tap water??? Lynn, I so understand what you mean, I always choose learning versus sleeping. But you should really take care though, you're still recovering. Is it just my imagination, or are festivals a French specialty? There are so many! Perhaps this is part of what I miss about Paris -- all the fun, creative energy! What kind of fish DO live in the Seine? I drink the tap water in France no matter how many fish they say are swimming in my glass. BTW, did anyone read the article in the New York Times today(Page A6) about the new disease in France called Sarkosis? No joke, it is an "unhealthy fascination with the French president"identified by Serge Hefez, a French psychiatrist. Thanks Monica, yes i do have to take care, you're right. Just simple jobs around the house today and i'm whacked! Each day a bit better though. I love to learn. I'd happily go back to university for the rest of my days, studying this then that. Guille yes, and la romanche is of course the inner, owned language so it's terribly important. My ex boyfriend, le Swiss (!) of many years ago seemed almost ashamed of it, because it's such a mix but i find it charming. I too love it when you speak in French. It is the chance for Monica and I to practise! Monica has a lot of opportunity now but i don't. I don't actually have any friends who speak French with whom i can converse here at home. It's a shame. I must add though, that Guille is kind enough to email me in French which is FABulous! Thank you Guille. I email back in English, though she hardly needs much practise. Zooming in, I love the way her left hand fingers are fanned out and the three costumes are fabulous. Great shot! The look on her face is interesting as well. You make my day, every day in Paris. I must say that it is always very interesting to hear what you have to tell of your past, Lois. People certainly become more and more interesting with age; that's when you've had time to (hopefully) accumulate experiences and knowledge of the world. You simply get more, how should I put it?, to share with others, which makes for an interesting person. When you're relatively young, like me, you haven't had the same amount of time for these things. Not that one needs to be uninteresting because of that, but I certainly think "older" people have more to give. I like that! Parisian Heart -- yes, I'm a copy editor, too -- I work for a magazine here in NYC. Phx -- I'd sooner drink the tap water in Paris than in Washington, DC! Haha, thank you, I'll certainly try and get busy! Alexandra, Thank you. "...I certainly think "older" people have more to give. I like that!" My daughter told me something similar after she was talking to a neighbor of mine who was in her 80's. My daughter is 26 and talks to me as though I am her best girlfriend. She doesn't think I am old enough to be interesting. Her name is Axella-Charlotte. I named her after her father, who is Swiss. I am French-American. So she is quite a combination of cultures. Alexa, I agree that having an interesting life starts at any age. For example, when my daughter was little, she was always going on field trips with her class at school. She would come home and tell me the most interesting adventures. I use to tease her about it, and say she had seen more of San Francisco than I had. Sometimes I call her "old lady Char" because she appears wise. I have done more paintings of her than anyone. For years she was my number one model. I remember once in the Met art museum in NYC I happened upon a painting by Edison, the inventor. It was of his daughter. It is magnificent. I said to the man I was with, "if I had a daughter, I would paint her continuously". And a decade later, it happened. Here is one of the first ones http://www.loissimon.com/010_10.htm I'm sorry if the color is washed out in the photo -- it looks over-exposed. Anyway, I do not own the painting anymore. It was bought by a doctor from Japan, Mayumi Maeda, who is also a poet. I think I told Buzzgirl and Katie about her when they were looking at some of my paintings as she has bought a lot of my work. Speaking of painting, if I had taken that photo "Festival de l'Oh 2008" by Eric, I would have turned it into a painting. I do that when I want a photo preserved. Plus, I prefer large format. I don't do it too often because I am never really happy with my photography -- it's just a side to my work. Guille, I too think it is charming the way you mix your French and English. Someone else does that here at PDP - it is endearing. I know gazillion ex-patriots here in San Francisco and they do that too. I love it -- do not stop. Lois, I like your paintings but I think that one's my favorite. Phx - if you drink tap water in France, I assume it's pretty safe. A very good tip for the next time I'm in Paris. Yes Eric this photo is very cool. Bird cage artists :) It sounds like a great festival. I just love the short films in "Paris je t'aime" too. And the one with the mime artists is so sweet. I have been listening to French music all day. My girlfriend came by and gave me a CD called "L'autre bout du monde" with Emily Loizeau. It's fantastic. Those of you who doesn't know it, you should really check it out, her voice is so lovely. Thank you for your kind compliments Petrea. This is the most popular painting of mine, "Souvenir de Paris" http://www.loissimon.com/038_38.htm Every time I see Pierre he tells me that he is all out of the gallery cards. It just flies out the door. I have a copyright on it as advised by my attorneys. Lois, I just went to your homepage to see your paintings. They're lovely, and of course the Paris souvenir is my favourite too. Where can I buy the postcards ? No I didn't see the vidoe, but I'll do it NOW. Thank you for telling me. Signature Scrapbooks, I use to follow along too and occasionally send Eric an email. However, he got way too popular and busy, so I started to communicate this way. A few years ago he would only get maybe a half dozen comments a day compared to his 80+ on a busy day and 50+ on a slow day. Wow Eric! Bettina, Merci beaucoup, big thank you, ringraziarla molto, gracias tanto, muito obrigado, Vielen vielen Dank, спасибо очень, どうもありがとうございます. I thought I would say a BIG thank you. Lois, Thank YOU. I would love to have some of these postcards. You're SO kind !!! Okay, Bettina, I'll send you an email and you can reply with your address. are you going to tell us the story about the Arab prince? Don't you love the ukalele? Rose, Yes, I have noticed that the increase in PDP's popularity usually occurs right after the PDP picnics. I guess it's because it becomes real as opposed to virtual friendships. i am in LHR now and drink the water here, mxp, zhr,bru,gig,gru,etc, and haven't died yet. I even drink it in phx, too. Lois "I bet you took more than just one photo? ". I took thousands of photos! And you're right I thought of the Cirque du soleil also. "Years ago, I had a Swiss-Italian boyfriend, and he spoke 8 -- count 'em, 8 -- languages fluently." Yeah, yeah, but it's a small country, they are bored, they have nothing else to do than learning languages LOOOOOL! "You're very kind, Eric :-) But typos are interdit in my OCD world. " I know, I work in a magazine, I know how demanding copy editors are!! Christie "Can you imagine how difficult that would be on a moving boat?" I don't know actually. The boat looked pretty stable. Lynn "I really should be in bed but there's a documentary on tv which is compelling. All about les maisons closes! " What?! Is that what they show of the "French culture" on British television??? So, Le Sphinx... Funny you mention that name because it must have been really famous; I heard about it in my youth (as a historical landmark, because even then it was closed - brothels are forbidden in France). OK Tall Gary; 10 points for your tripple pun! (In case you don't know the reference, "10 points" has become a sort catch phrase in Europe because we hear that a lot during the Eurovision contest). Kelly "Hey! I live in Geneva... :)" obviously my previous comment about the Swiss does not apply to you LOL! Petrea "I like how you cropped this, Eric." I did not crop it - too much - actually. I took it like that. Monica "So Eric, I really wanted to know: to drink or not to drink tap water???" in fact, yes, they highly recommend drinking tap water. They say it's more environmentally friendly that bottled water. Parisian heart "Is it just my imagination, or are festivals a French specialty? There are so many! Perhaps this is part of what I miss about Paris -- all the fun, creative energy!" Soooo true! PHX-CDG "What kind of fish DO live in the Seine?" You'd be amazed. Tons. People fish too... About the article, no I did not. But Serge Hefez is famous here. David "I think I'll start a campaign to have a similar busts of Frédéric Bartholdi and Gustave Eiffel placed at the foot of the Statue of Liberty." OK, let's start a petition! Bettina "Yes Eric this photo is very cool. Bird cage artists :)" Excellent. I like the expression ;) I don't know who Emily Loizeau is though... Shame on me. But I just checked Lois' link. And yes, it's nice. I like the lyrics. Coltrane "Is there a monkey and a grinder working as well? ;-)" No! Funny what you say about the LA expression "way TOO cool. I'm interested in the the "TOO" as we've been using TROP instead of TRES (very) for several years now, and I wondered why. Maybe we copied the Lasanlegites, or they other way around. I was a bit nervous to comment, but thank you for the warm welcome. I live in Arizona and have been to Paris 1 time. My daughter's name is Paris also :) We are taking her to Paris in January for her 6th birthday. The website is great, I find new things daily to look at and admire. Eric's sense of humor and photography is a shining light in the "blog world"
lol Eric well it's not the only part of France they show on British tv but yes this was on. I just happened to see it, it was so interesting. Built in 1937 if i remember correctly, it achieved notoriety with German officers visiting it during the war. It seemed quite an interesting building, apart from anything. I'm guessing it's gone now? Or perhaps just different usage of the building? Whoops! Sorry, Eric, a bad guess on my part. I should have said I like the way you *took* the photo! Signature Scrapbook I echo the others: Welcome! Eric thanks for the info. Now that I'm sure it's ok to drink tap water I'll save a lot on bottled water next time I go to Paris. PHX: do you really drink tap water at GIG and GRU??? Wow I didn't know one could survive that. Here we don't drink tap water. I'm intriged...! A while ago Ham from London DP published an article this same subject. Thx Rose! I did know about PHX CDG. BCN also (Barcelona), but I didn't know about the Brasilian names. Bravo, Eric! What a tremendous feat you accomplished with all those responses! You are so gracious. Shawna ... I join in the welcome ... I only found this site a few weeks ago, and I am totally hooked. This is such a fun, friendly place. And I am enchanted by the idea of your taking your daughter Paris to Paris -- What a dream! Does she know all about the city already? I collect kids' books about Paris; they are such a fun way to share the City of Lights with children.